Hello, new member here! I recently got two Ecuadorians. 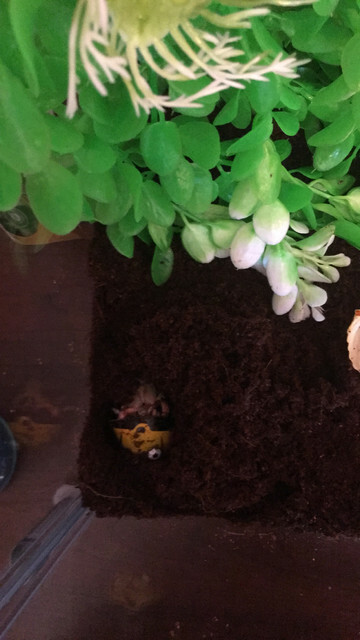 3 days ago I got them set up in their new 10 gallon tank, and Davey went straight for their coconut hut and began to dig. 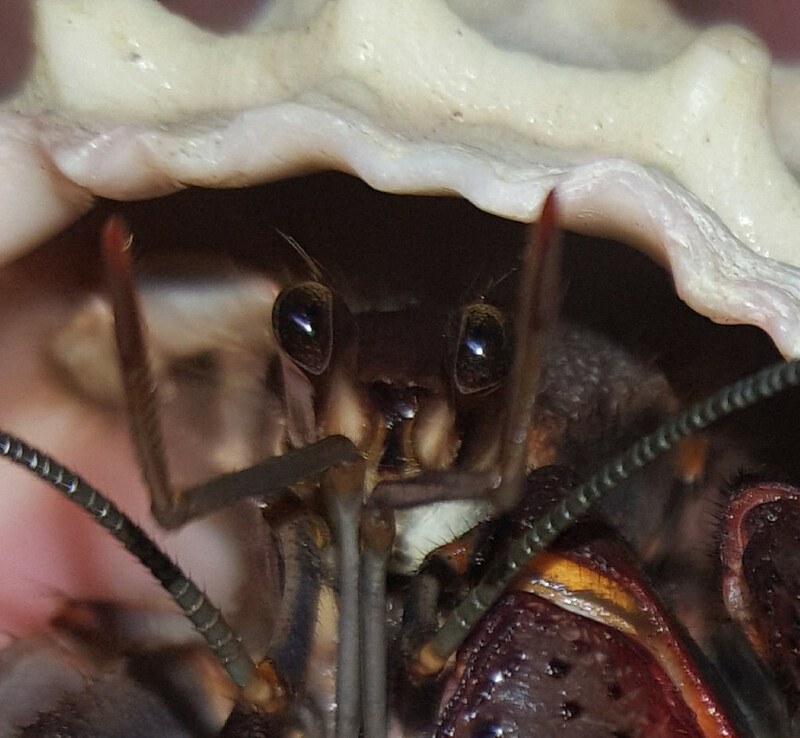 I am 98% sure he is molting since I lifted the hut and can see what appears to be the exoskeleton. My problem is that I am about to go back to college and I was planning on taking them with me. However, I have been reading that it isn't recommended to move their tank while molting. Digging him up to move him to another container terrifies me because I am scared that I will hurt him. I am concerned with leaving my family to take care of them until Davey is finished molting. Any suggestions? Here is a picture of how Davey is situated under the coconut. The reason you should never move a tank with molting crabs is because the tunnel and cave they are in can collapse on them. If you are positive he didn't die and that he molted and that is his exoskeleton you see, then cut a plastic drink bottle in half. Use one that is smaller than a 2 liter but large enough to go over and around the crab. Place the cut bottle gently and snugly down over the crab pushing the cut side of down all the way into the substrate using a gentle twist with drinking spout almost touching the top of your crab. Spout side should be up. Then cover it with a dark thin cloth that air can get through. If you don't have far to go with your tank then that should secure him enough to move. If you have quite of a drive, then go to a drug store or WM and get a hot water bottle. You can fill it with warm water and place it on the back side of the tank right about where the crab is setting. When you get settled, you can carefully remove the plastic bottle and replace it with a cut 2 liter the same way to give him a cover over him for security and protection from being eaten by the other crab. He should do fine. Never touch molting crab or dig one up. They are jelly until they harden. They surely will die. Last edited by sallrw on Mon Jan 07, 2019 10:39 am, edited 1 time in total.